MobileToolz™ is an All-in-One suite of business and productivity applications, encompassing a vast amount of new and current capabilities. Consisting of multiple compatible and interwoven modules, MobileToolz™ enables direct printing, faxing, image processing, document upload, download, sharing, screen sharing, mobile presentations, mail multiple attachments, and much more. A comprehensive Documents module, complete with a Documents Viewer with support for a wide array of document types, including PDF, MS Word, Excel, Microsoft PowerPoint, JPEG, TIFF, PNG, and many more. Documents Module supports faxing, printing, and emailing. 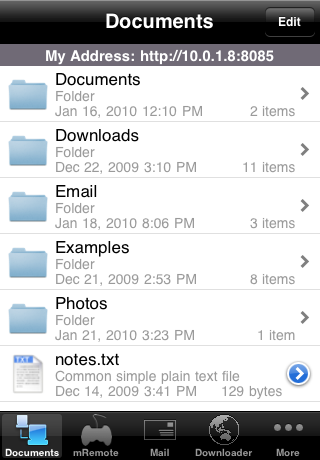 The Documents Module also includes support for uploading existing documents from your computer, as well as creating new ones on the iPhone. Mobile-to-Mobile document sharing. Share documents directly from iPhone/iPod to iPhone/iPod. Mobile-to-Mobile/PC screen sharing. Give wireless presentations directly from your iPhone, projecting your iPhone's screen. This enables unfettered and impressive delivery of mobile demos. MobileToolz™ is the first and only iPhone application to enable Mobile Presentations. Direct printing to networked printers, and also to shared printers. No companion software installation necessary. Faxing globally to over 250 countries and territories worldwide. MobileToolz™ Fax has native support for practically all types of documents, including Adobe PDF, Microsoft Word, Excel, Bitmap, TIFF, Text, HTML, Open Office documents, GIF, encapsulated post script, and much more. No subscription or signup required. Capture and process images using MobileToolz™ Photo Lab. Flexible image capture channels include camera snapshots, photo album, and stored photos. Snap pictures of documents and prepare them for faxing using the Photo Lab. Fax, print and email images directly from the Photo Lab. 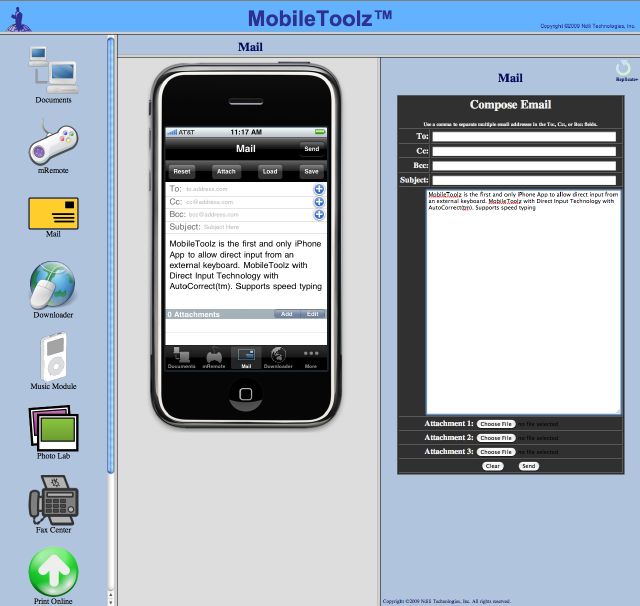 MobileToolz™ Mail Module allows for drafting and saving emails. It also supports multiple attachments. Type directly into your iPhone with MobileToolz™ Mail Module using any regular keyboard attached to any computer (Mac, PC, Linux, etc) with a web browser. MobileToolz™ is the first and only iPhone application to support external keyboard text entry via our patent-pending "Direct Input Technology" (DIT) with Auto-Correction. Print documents directly to FedEx Online (formerly known as Kinko's). FedEx Office is the expert at printing manuals, presentations and business documents, with over 1800 locations worldwide. 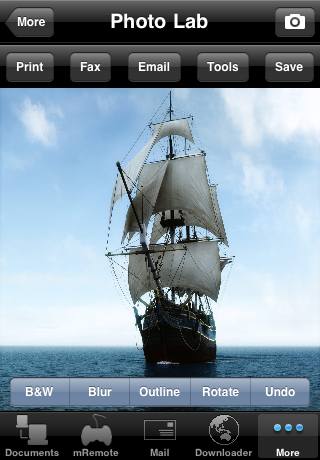 MobileToolz™ is the first and only iPhone/iPod application to enable Print Online. Online Downloads: download online documents directly to the iPhone. Flexible PC Access for documents on the iPhone, via both WebDAV and regular web browsers. 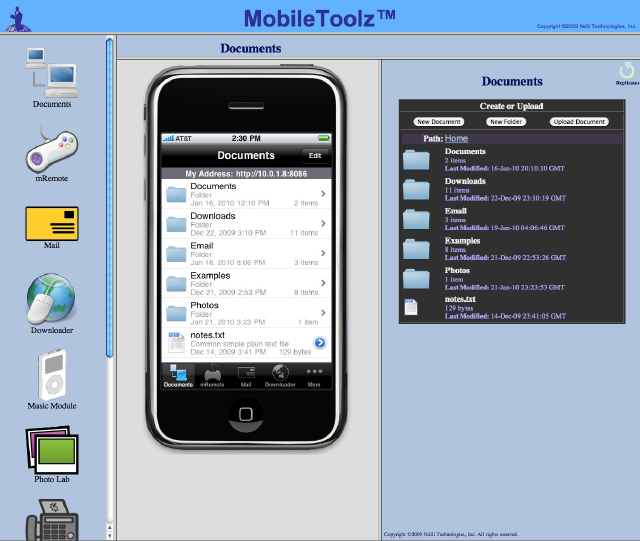 MobileToolz™ includes a large amount of functionality, some contained within the App, some accessible when used in conjunction with a desktop computer. Launch MobileToolz on your iPhone/iPod and note the web address that appears on the Document module. It should be of the format "http://x.y.z.a:8080" (actual numbers will vary depending on your network). Open any web browser from your PC, and enter the MobileToolz URL from the previous step. You should now have a Command Panel on your PC, which you can use to navigate your iPhone and utilize several of MobileToolz's functionalities, such as Remote Presentations and External Keyboard use (see screenshot below). The Documents Module acts as a repository or flash drive, for storing documents, pictures, and folders. The tips below will help you maximize your use of this module. To view the contents of a document or folder, tap the name or icon of the document or folder. To view information about a document, tap on the Detail Disclosure button (blue arrow to the right of the document). You can also view information about a document by tapping on the "Info" button available in the Document Details view. Select the document then select "Info". Note: Tapping anywhere other than the Detail Disclosure button will directly open and display the document instead of showing information about it. To print a document, select the document, then select the "Print" button, and then choose a printer. (See Help on Printing section). To fax a document, select the document, then select the "Fax" button, and then choose and fill in a coversheet if necessary. (See Help on Faxing section). To email a document, select the document, then select the "Email" button, and then fill in and send the email. (See Help on Email section). Use the Edit button at the top right corner of the Document Module to create files and folders, download documents from the web, and delete documents and folders. To create a new document, select the "Edit" button, then select "New Document". The "New Document" menu will be located at the top of Documents Module when it is in Edit mode. Scroll up, if necessary to view it. Enter the file name and file content. Be sure to append a ".txt" to the file name. The "New Document" button lets you create new text files by default. To create a new folder, select the "Edit" button, then select "New Folder". The "New Folder" menu will be located at the top of Documents Module when it is in Edit mode. Scroll up, if necessary to view it. Enter the name of the folder and then tap "Save". To delete a document or folder use the Edit button, OR simply swipe from left-to-right across the file or folder's name. Note: The folders that shipped with MobileToolz™ cannot be deleted. This is because the App requires these folders to be present as the default location for its various modules. To download a web document into any folder, navigate to the folder, then select "Web Download". The "Web Download" menu will be located at the top of Documents Module when it is in Edit mode. Scroll up, if necessary to view it. Enter a name for the file to be downloaded (be sure to add the correct file name extension! for example: .pdf). Enter the URL of the file. Note: You can also download web documents using the Downloader module. Note: It is important to enter the correct file extension for any downloaded files otherwise there may be problems with viewing, printing or faxing the file. If you selected "Edit" to enter the edit mode, be sure to tap on "Done" when you are finished with Editing, otherwise the Documents Module will remain in Edit mode. The mRemote Module enables you to connect and share documents with other mobile users or devices running MobileToolz™. mRemote also enables you to share the screen of your device or view the screen of other mobile devices with MobileToolz™. By default, at least one device, your mobile device, will show up on the mRemote list. Note: selecting your own device on mRemote gives you the experience of a remote user. To most effectively use mRemote, you need at least one other mobile device running MobileToolz™. 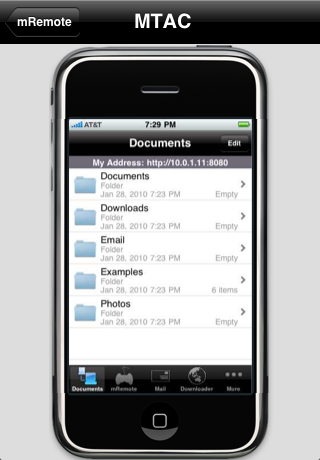 With mRemote you can remotely browse files, print, fax and download remote files unto your iPhone/iPod. 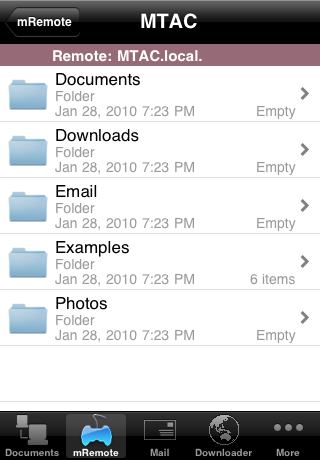 Any files you download using mRemote will be stored in the "Downloads" folder of the Documents Module of MobileToolz™. Launch MobileToolz™ on your (local) device, select the mRemote Module. The remote device should automatically show up on the list of available devices. If you don't see it, wait a few seconds for MobileToolz™ to detect it and for the screen to refresh. Select the remote device by tapping on the device's name or anywhere on the row except for the details disclosure button (blue button at the right). If you tap on the details disclosure button you will launch mRemote's screen sharing mode instead. Navigate through the folders as you would do on your local Documents module. Select documents for viewing, printing, faxing and downloading. To view a document remotely without downloading it to your downloads folder, tap the "view" button. Select the remote device by tapping on the device's details disclosure button (blue button at the right). Do not tap on the name or anywhere else on the row. If you do, you will launch mRemote's document view and download mode instead. The current screen view of the device should appear. This view will update as changes occur on the remote device. You can pinch, zoom, pan and scroll the image using the standard iPhone gestures, to size the screenview or zoom in as desired. Double tap the image to automatically scale and center it. The Mail Module enables you to compose, store, recall, edit, and send emails. It also enables you attach one or more documents from the Documents Module to each email. The Mail Module also supports external keyboard use from the Command Panel from a computer (see Quick Start Help Guide for help on launching the Command Panel). To compose an email, simply tap the Reset button to clear the screen, then start typing. To add recipients in the To:, Cc: and Bcc fields, type in the email addresses separated by space. You can also tap on the blue email address selection buttons on each field to quickly select existing email addresses from your address book. To add attachments, tap the "Attach" button from the top toolbar. You can also use the "Add" button from the Attachments toolbar at the bottom of the screen. To remove attachments, tap the "Edit" button from the Attachments toolbar at the bottom of the screen. Red delete buttons will appear beside each attachment. Select the delete button of the attachment to be removed. After editing, be sure to select the "Done" button. You can also PREVIEW attachments. 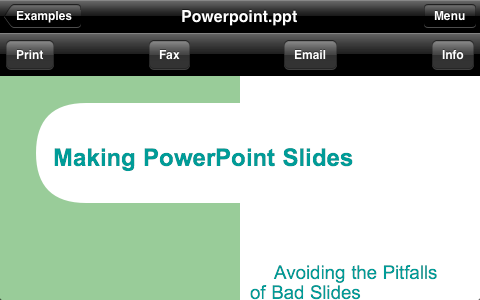 To preview an attachment, tap on the document name or its icon. To view information about an attachment such as file type, size, and its creation date, select the blue details disclosure button on the right side of the attachment listing. You can also PREVIEW the attachment as described above, and then select "Menu", then "Info". To directly print, fax or separately email any attachment, PREVIEW it first as explained above, then select "Menu", and then "Print", "Fax" or "Email". To save an email draft, tap on the "Save" button. The email will be saved in the "Emails" folder of the Documents Module, in a special format that would preserve references to the selected attachments without taking up any additional storage. You can view saved emails by going to the Emails folder of the Documents Module. To recall or load a saved email, tap the "Load" button. To send your composed email tap on the "Send" button. This will launch a menu that will allow you finalize your email and then queue your email using the standard default mail service on your iPhone/iPod. Note: You can attach an unlimited number of attachments. The Attachments list at the bottom of the screen is scrollable - you can slide the entire table up or down with a swipe. The Downloader Module enables you to search and browse the web and also download online documents to your iPhone/iPod Touch. In the Mobile Presentation mode, the Downloader module allows you to remotely present mobile web sites from your phone. See Help On Mobile Presentations. To browse the web, enter the URL of the website in the field in the menu bar. Enter a name for the document to be downloaded. Be sure to enter a filename with the correct file extension, for example: .pdf. Otherwise you may not be able to view or fax the document. Enter document's URL. This may already be prefilled for you if you have already navigated to the document using the Browse functions of the Downloader Module. Tap the "Save" button. The document will be downloaded to the "Downloads" folder of the Document Module. Note: You can download a wide variety of document types, including PDF, Microsoft Word, Excel, Zip file archives, text, html, and much more. For each type of file, be sure to select a destination filename with the appropriate file extension. To search the web using Google search, enter the search terms in the Google Search field at the bottom of the Downloader Module's screen. Note: you may have to scroll down to view this search field. 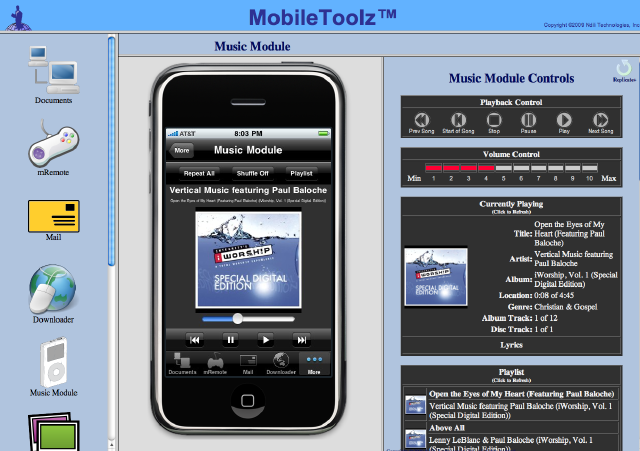 The Music Module enables you to utilize the full iPod functionality of your iPhone without leaving MobileToolz™. You can create playlists, select songs, start, stop, pause, and skip songs, configure repeat as well as shuffle, and view details of playing songs. The Music Module also includes the PodController™, which enables you to remotely control your iPod functionality from a computer, using the Command Module. This is very useful in situations where you have your iPhone or iPod Touch physically connected to your stereo equipment located out of reach. With MobileToolz™'s Music Module and its Command Module, you can remotely start, pause, stop, and skip songs, as well as remotely control the volume of your iPhone/iPod Touch. See Help On Remote iPod Control™ for help on using the PodController™. To configure or edit a playlist, tap the "Playlist" button. Then tap the "Add" button to add songs to the playlist. Your playlist will begin to play automatically after you configure it. To hide the playlist after viewing it, tap the "Hide" button, or simply tap the "Playlist" button again. To adjust the volume, slide the volume bar at the bottom of the screen. The Photo Lab enables you to acquire, modify, save, print, fax, and email photos. New photos can be captured using the built-in camera of your iPhone. Photos can also be uploaded from a computer or acquired from the existing photo album. Select "Photo Album" to select and use a copy of a photo from your photo album. Note: the original image in your photo album remains unmodified. Select "Documents Module" to select and use a copy of a photo from the "Photos" folder of your Documents Module. The image you select becomes your 'working' image and is stored temporarily as the desktop of your Photo Lab. When capturing an image from the camera, you can zoom or pan to choose the area you want to work with. Use the tools in the Tools bar to process your email. The Tools bar contains tools for setting black and white mode (B&W), blurring image, taking an outline, and rotating the image. It also contains an "Undo" button which allows you to undo up to 10 steps of actions. The primary function of the Tools bar is to prepare images for faxing. To this end, the tools contained in the toolbar will change color images to grayscale for better faxing. Tap the "Tools" button to toggle the visibility of the Tools bar. To permanently save a copy of the 'working' image in its current state, tap the "Save" button. You can use the Save button to save versions of your working image. To Print, Fax or Email the working image, tap the "Print", "Fax" or "Email" button. If you want to fax the current image, it is recommended that you 'process' the image before faxing: convert to black and white, and/or use the Outline function. This will give you a better fax result and save you fax time and costs. Note: You can transfer pictures from your built-in photo album to your Document Module. To do this, first select the image from the phone album, then tap on the "Save" button. The Fax Center contains all the interfaces required to manage your faxes, including resources to keep track of faxes in progress, completed and failed faxes, manager fax coversheets, view fax account balance and purchase new fax units and coversheets. MobileToolz™ comes with 4 free fax units to get you started. You can purchase more fax units on demand as needed via the Fax Center. To view you fax account balance, tap on the "Account Balance" row. Your account summary will be displayed at the top of the page, and will include your credits and usage. Tap on the Credits or Usage row to automatically scroll to those sections. To purchase additional fax units, tap on the "Purchase Fax Units" row. 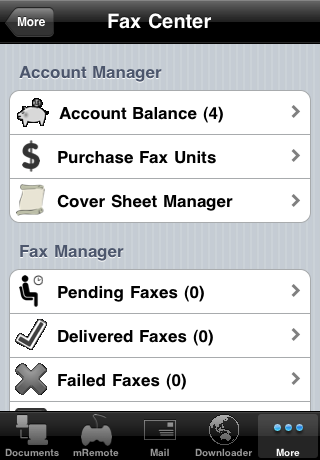 To view your existing fax coversheets tap on "Cover Sheet Manager". To purchase additional coversheets, tap on "Cover Sheet Manager" then select "Cover Sheet Store". When viewing any of the above fax lists, tap on any of the listed faxes to launch the "fax details" view which shows the details of the selected fax. 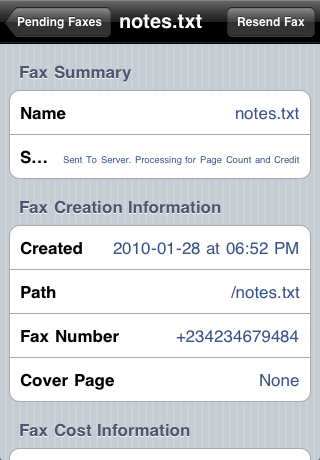 In fax detail mode, you can tap on any row to view the detailed description of that row. To resend a successful or failed fax (for example: to another destination), select the fax detail page from "Fax Center -> Delivered/Failed Faxes -> Your Fax", then tap "Resend"
Tip: When you send a fax, allow a few seconds after tapping "Send" to ensure the fax is successfully uploaded. You can confirm successful upload by viewing the status of the fax under the "Pending Faxes" list of the Fax Center. Before you quit the mobile app, the status of your fax should at least say "Sent to Server" (see below). Once this status is reached, fax processing will continue even after you quit MobileToolz™ and you will be notified of the success or failure of your fax via push notification. To view current fax rates, select the "Fax Rates" row under the Fax Center. The Print Online Module allows you to upload and print files online. The Settings Module enables you configure important options which control the behavior of MobileToolz™. Turn "Require Password" to "ON" to enforce security and password requirements for any user trying to connect to MobileToolz™ from a web browser or via WebDAV. See the Help On File Transfer To/From A Computer section for help on file transfers. Ensure a username and password are setup prior to turning "Require Password" to ON. 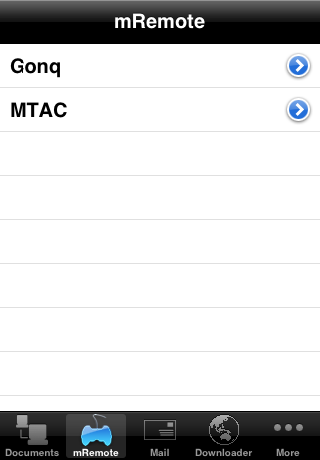 Tap the "Assign Randomly" option to allow MobileToolz™ randomly assign a port. Tap the "Fixed Assignment" option to force MobileToolz™ to use a fixed port number. Enter your preferred port number beside the "Fixed Assignment" option. MobileToolz™ will try to use the port number entered here, if available. If not available, the next closest port number will be used. Replicate Server: Controls the Command Panel (MobileToolz™ self-contained Web Server used for remote web browser access as described in the MobileToolz™ Quick Start Help Guide). Documents Server: Controls the WebDAV service (MobileToolz™ self-contain WebDAV Server used for file transfer as described in the MobileToolz™ Quick Start Help Guide). Show System Files: Toggle the visibility of system files in the Documents Module. Default value is OFF (system files are hidden). Hide File Extension: Toggle the visibility of file extensions in the Documents Module. Default value is OFF (file extensions are shown). Log on to MobileToolz™ from a computer's web browser, as described above in the "Quick Start" section above. Select the "Documents" module from the Command Panel on your PC or Mac to set the PC Command Panel in 'Documents' Mode (this is the default mode once you launch the Command Panel). The screen shown below will appear. To upload a document to your iPhone/iPod from your computer, select the "Upload" button and choose the document. 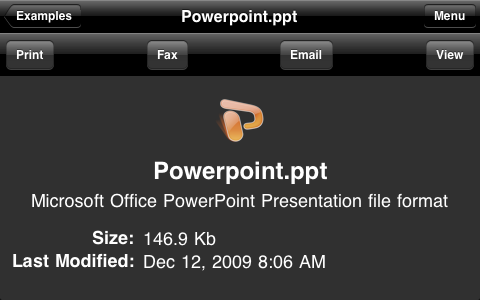 To view or download a document from your iPhone/iPod to your computer, click on the document icon or name. To navigate into a directory, click on the folder's icon or name. To navigate back up directly to a specific folder , click on the folder's name in the purple Path panel. To return to the root folder, click on the "Home" text in the purple Path panel. To create a new folder inside the current folder, select the "New Folder" button. To create a new document within the current folder, select the "New Document" button. Be sure to add a file name extension: *.txt. For safety reasons, documents can only be deleted directly from your iPhone or iPod. Remote deletion via the web is not permitted. To delete a file or folder, select the Edit button from your iPhone's document module and then tap the delete button. An even easier and quicker way to delete exists: simply 'right-swipe' the document or folder (slide your finger from left to right across the document or folder). Note: the original folders that shipped with MobileToolz™ cannot be deleted. MobileToolz™ consists of multiple modules and services running simultaneously. It uses A.I. (artificial intelligence) to allocate its resources based on the module in use. When using Web Browser access, performance of MobileToolz™ Web Browser and Control Panel module (including screen refresh rates) will improve significantly after approximately 60 seconds, as it diverts its computing resources to focus on the task at hand. MobileToolz™ contains a feature-rich WebDAV Server that enables you to access documents and folders in 'native' mode. To use the "WebDAV" method, follow the steps below. Then select "Connect" (See screen shot below). You should be able to open up the MobileToolz documents folder in a native computer window. Drag and drop files and folders, and delete/create files and folders as you would natively do on your computer. You should be able to open up the MobileToolz documents folder in a native computer window. Drag and drop files and folders, and delete/create files and folders as you would natively do on your computer. Remember: You always have the backup of using the Web Browser method, which is compatible with all computers. Using the Command Panel to navigate to the "Mail" module. Note, once you select Mail Module, both your iPhone (Mobile) and Command Panel (PC/Desktop) views will switch to the Mail Module. (see screenshot below). On the Command Panel, select any field and start typing. Your text will appear on your iPhone/iPod as you type. MobileToolz's text entry includes Auto-Correction so you can type as fast as you like, corrections will appear seconds later. Note on MobileToolz™ CPU Optimization in Typing Mode: MobileToolz™ consists of multiple modules and services running simultaneously. It uses A.I. (artificial intelligence) to allocate its resources based on the module in use. When using External Keyboard input, performance of MobileToolz Keyboard Entry will improve significantly after approximately 60 seconds, as it diverts its computing resources to focus on the task at hand. Load up the document you want to present onto MobileToolz's Document module using either a WebDAV connection or a regular web browser (Command Panel - Documents Module). If you want to display mobile web pages, simply open up the webpage on MobileToolz on your phone using the "Downloader" module, which is also a mobile web browser. Connect to MobileToolz from a PC as described above. From your PC, click on the "Replicate" button to launch a stand-alone, live replica of your iPhone on the PC. Connect the PC to a projector. You should now be able to project the contents of your MobileToolz iPhone screen. The projected screen will track the screen changes you do on your iPhone. You can adjust the screen update rate from the Settings module of the Command Panel (Computer-side). Note on MobileToolz™ CPU Optimization in Mobile Presentation Mode: MobileToolz™ consists of multiple modules and services running simultaneously. It uses A.I. (artificial intelligence) to allocate its resources based on the module in use. When using Mobile Presentation mode, performance of MobileToolz Screen Update rates will improve significantly after approximately 60 seconds, as it diverts its computing resources to focus on the task at hand. Faxing with MobileToolz™ is very easy: simply press the "Fax" button from any document view (in the Documents and mRemote modules) or from the Photo Lab. Then select a coversheet if needed, fill in the fields and tap "Send". There are, however, a number of tips you should know to help you maximize the powerful faxing potentials of MobileToolz™ and avoid common pitfalls. You can fax any document directly by selecting the document from the Documents Module of MobileToolz™. You can also capture, modify and fax images from the Photo Labs Module of MobileToolz™. Make sure your documents have a filename extension. For example: a PDF document should be named 'something.pdf'. Uppercase or lowercase filename extensions do not matter. 'something.PDF' is just as good. Ensure documents have the correct filename extension: for example: .txt for text files, .xls or .xlsx for Excel spreadsheets, .jpg for JPEG images, etc. Ensure you include the country code in the fax number, even if you are faxing to a local number. For example: "+12121234567" for a USA New York destination. Do not include any leading zeros in the area code. For example: for UK numbers, drop the leading "0" for London, and simply use "+441...". Important: When you send a fax, allow several seconds for the file to upload before exiting from MobileToolz™. You can confirm that fax upload is complete from the Fax Center: Select "Pending Faxes" and wait a few seconds for the status "Uploading" to change to "Uploaded..." or some other status. If you immediately quit MobileToolz™ after hitting the Fax Send button, your fax may not fully upload, and may be delayed, as upload will resume when next you launch MobileToolz™. To resend a completed or failed fax, navigate to the fax details page, then select "Resend"
To cancel a fax that is awaiting credit top-up, navigate to the fax details page, then select "Cancel". Note: You can cancel only faxes that are awaiting top-up, since all other 'in-process' states are indeterminate. Note: The fax preview pane can been scrolled, zoomed and panned. As you fill in cover page details, they appear immediately on the preview pane. Zoom to view details. Fax upload only takes a few seconds, sometimes less. Once upload is complete, you may quit MobileToolz™ if you choose. Faxing will continue via the remote Fax Servers, and you will be notified via Apple Push Notifications once your fax is completed. Four (4) Fax Units are included free-of-charge, to enable immediate faxing/testing. Additional fax units can be obtained on-demand via In-App purchase, at approximately $0.99c per four units, or less with bulk purchase. 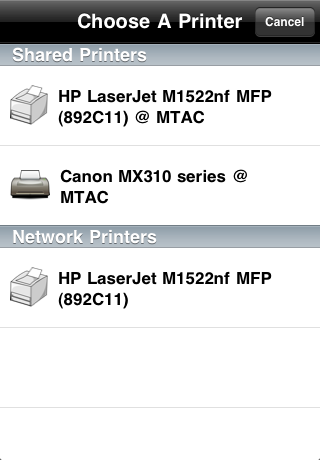 When you select the "Print" menu option (available in the Documents Module, the mRemote Module and the Photo Lab), the list of discovered printers will be displayed, separated into these two categories, as shown below. Your printer should be connected directly to a network, for example: either through ethernet or Wi-Fi. That is, your printer should have its own IP address. Your printer normally automatically configures this once it is connected to the network. Ensure your printer's IPP (internet printer protocol) option is enabled. This may be on by default on some printers. On others, you may need to access the configuration options of the printer, either directly, or through a web browser or PC, to enable it. Next, access the same network (Wi-Fi) with your iPhone, and then launch MobileToolz. MobileToolz will scan the network and should detect connected network printers. This process should happen within about 30 seconds or even less. Select the document your want to print from MobileToolz and tap the Print button. If you do not see any printers, please check to make sure that your printer is connected to the network, that IPP (internet printing protocol) is enabled, and that you are on the same network with your phone. 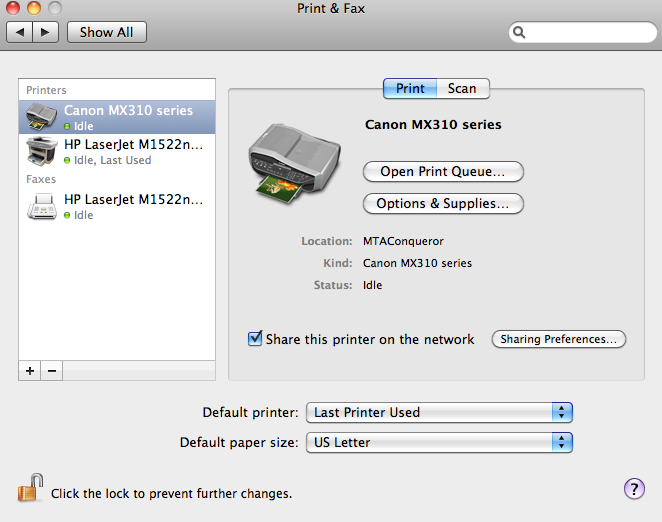 select the printer from your computer's System Preferences -> Print & Fax panel, and enable shared access by clicking on the "Share this printer on the network" option. 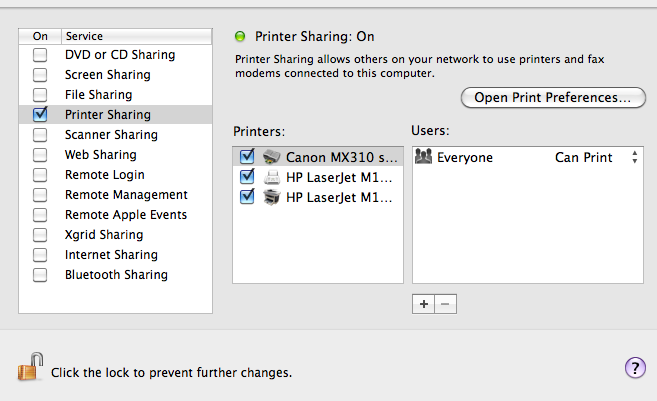 Check your "Sharing Preferences" to make sure "Printer Sharing" is also checked. After the above one-time configuration, launch MobileToolz from your phone and log onto the same network as your computer. Make sure your computer is turned on (and also ensure the printer is turned on). You should then be able to see and print to the shared printer directly from your phone. When sending email from the Mail Module of MobileToolz™, you can save and restore draft copies, and attach multiple documents. The current draft is saved automatically when you quit MobileToolz™. When sending email from your computer using the Command Panel, you can compose email very quickly using an external keyboard. Text that you type automatically appears on your phone. MobileToolz™ includes AutoCorrect™ technology, which updates your mobile phone with corrections a fraction of a second after you complete typing from an external keyboard. As a result you can type as fast as you want and don't have to wait for your phone to catch up. One second after you complete typing, AutoCorrect™ will ensure all your text is correctly displayed on your phone. 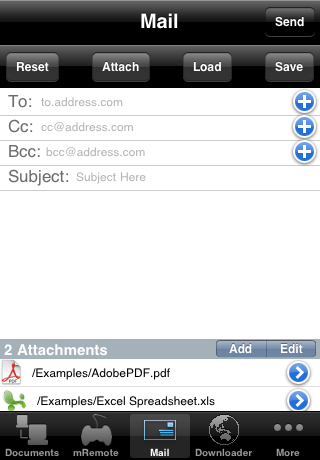 When using the Command Panel to send email from your computer, you can also upload documents as email attachments directly from your computer to your phone. Up to three documents can be uploaded at a time from your computer. See Quick Start Help Guide for help on launching MobileToolz™ Command Panel. To email single documents from the Documents Module, select the document and then tap "Email"
To email single photos from the Photo Lab, load the photo as described in The Photo Lab section, and then tap "Email"
MobileToolz™ includes PodController™: which features the ability to remotely control your iPod or iPhone's iPod module from any computer with a web browser. 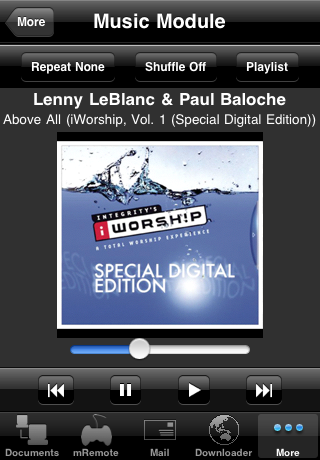 Access your iPod, change volume, view current playlist and song, with title, track info and lyrics, where available. Remotely start, stop, pause, rewind, and skip the currently playing song. PodController™ works as a remote control for the iPod/iPhone, enabling users to start, stop, pause music and change volume remotely from their computer (Mac, Windows, Linux, others). In a typical configuration, the iPod/iPhone is physically connected to the stereo equipment, which may be located in a different room (for example: family room) from the user. PodController™ makes it possible for a user to remotely control their iPod music player without having to physically get up and walk over to the iPhone/iPod. Launch the Command Panel from any computer as described in the Quick Start Help Guide. On your iPhone/iPod touch, launch MobileToolz™ and select the Music Module. Configure playlist on your iPhone. Note: You can also configure your iPhone's playlist using the built-in iPod app before launching MobileToolz™. Your playlist will be preserved and your currently running song will continue to play and will show up in MobileToolz™ Music Module. Use the web-based controls of the Command Panel on your computer to remotely start, stop, pause the iphone, or change the volume of your iphone, or skip forward and backward past the currently playing song. There are numerous features and shortcuts built into MobileToolz™ to make your user experience as enjoyable as possible. The list below contains just a few tips to get you started. You will no doubt discover new ones that work best for you as you continue to use MobileToolz™. Faxing Tip: Before faxing images from the Photo Lab, 'Image-process' your images - change color to black and white, and if possible use the outline filter to drop most unnecessary detail. It will make for a faster and cheaper fax. 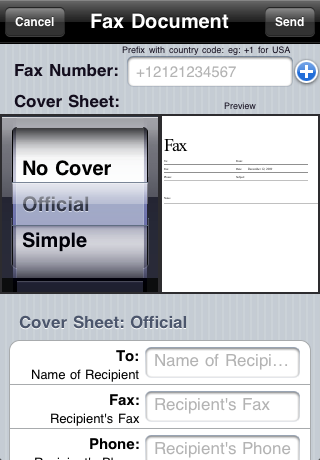 Faxing Tip: MobileToolz™ remembers 'permanent' fax coversheet fields, for example: your name. You do not have to enter these 'permanent' fields unless you want to change the stored values. Faxing Tip: When faxing, after selecting a coversheet, and filling out the fields, you can 'try out' other coversheets without having to re-enter any of the fields. MobileToolz™ automatically temporarily remembers all your entries and applies them to each new fax coversheet. You can even preview the 'No CoverSheet' option without losing your entries. All temporary fields are 'forgotten' after the fax is sent. Faxing Tip: When faxing, sure to include the country code when entering your fax number, even if your fax is going to a 'local' destination. Faxing Tip: When sending a fax, you can zoom, pan and scroll the "Preview" panel of your fax setup screen. Faxing Tip: To resend a successful or failed fax (for example: to another destination), select the fax detail page from "Fax Center -> Delivered/Failed Faxes -> Your Fax", and then tap "Resend"
Faxing Tip: Enable Push Notifications for MobileToolz™ for fastest fax processing and status notifications. Fax Center Tip: You can purchase additional fax coversheets. To do so, select Fax Center -> Cover Sheet Manager -> Cover Sheet Store. Downloader Tip: You can download a wide variety of document types, including PDF, Microsoft Word, Excel, Zip file archives, text, html, and much more. Downloader Tip: Be sure to enter a filename with the correct file extension when downloading a document from the web, either through the Document module or the Downloader module. If you do not select a file name with the correct file extension, you may not be able to view, print or fax the downloaded document. Documents Module: To gain more screen space when viewing a document, tap on the "Menu" button to make the menu bar disappear and use the gained space for displaying the document. Mail Module: You can attach an unlimited number of attachments. The Attachments list at the bottom of the screen is scrollable - you can slide the entire table up or down with a swipe. Mail Module: You can view saved emails by going to the Emails folder of the Documents Module. Music Module: You can configure your iPhone's playlist using the built-in iPod app before launching MobileToolz™. Your playlist will be preserved, and the selected song will continue playing while MobileToolz™ is running, and will be displayed under MobileToolz™'s Music Module. Music Module: You can use MobileToolz™ Command Panel to remotely control your iPhone's iPod module. See Help On Remote iPod Control to learn more. Photo Lab: You can transfer pictures from your built-in photo album to your Document Module. To do this, first select the image from the phone album, and then tap on the "Save" button. Photo Lab: You can upload images from your computer directly into your photo album and into Photo Lab using the Command Panel. Photo Lab: You can also upload images directly into the Photos folder of your Document Module. MobileToolz™ was designed and developed by Ndili Technologies, Inc. Copyright ©2010 Ndili Technologies, Inc. All rights reserved.